There are good ideas and there are great ideas but those ideas mean nothing unless you act on them. 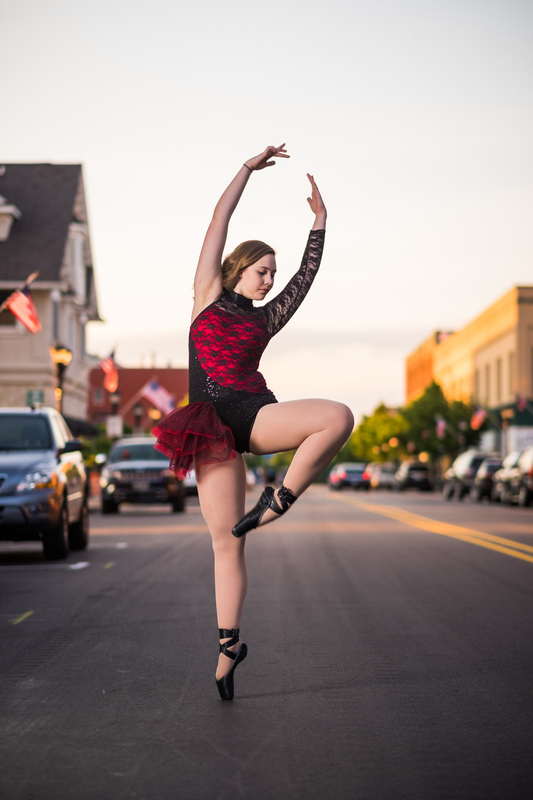 In this case, while walking through downtown Bay City on freshly paved, closed off streets, I vividly remember seeing photos of dancers doing their thing in the cross walks of busy intersections. Something about their beauty and grace mixed with the stiff facades of the buildings surround worked incredibly well for me and I knew it was something I had to try. Luckily I have a bunch of friends that are dancers so I asked them to meet me the next night by the friendship shell at 8:30, just enough time before a 9:15 sunset, and we got to work. Here we are, six girls in dance costumes, me with cases of gear, in the middle of downtown being watched by everyone in Studio 23 and bam we fire off the first few images of the night with Amanda and Lexi. They are EXACTLY what we were going for! From that point on I knew it was going to be such a fun night! I feel as I should mention that though the streets we are shooting on were closed the night before when I was walking, they are totally open now with people filling every parking spot and driving past constantly which got a little scary at times! We managed to work around all the traffic and at our second location in the shade of the Studio 23 building and looking straight down the road we see the tower of the train depot lit magnificently by the setting sun. This location was where we captured some of my favorites of the night! While in that second location we happened upon the hundreds of cyclists riding with BARS of Bay City (Bicycling Area Riding Syndicate) who made for an incredible backdrop to an already iconic, Bay City photograph. After multiple costume changes, shooting locations, and friend sightings we ended up being out there until about 10:30 and we all went home feeling satisfied that we captured some fantastic moments. The night was such an incredible opportunity to work with six amazingly talented girls and I can't thank them enough for coming out. These photos turned out so much better than I ever could have hoped. We need to do this again soon!